I know it’s been ages and ages since I’ve partaken in a bout of blogging. It’s sporadic at best, I know. I have so many things I want to say, and so much joy I get from this on small activity (although, admittedly, when I do it it is long and takes up a fair amount of time). I can’t even think of a sensible or profoundly fabulous title for this post. So that’s fun. Perhaps if I did it more frequently it would take far less time. But I doubt it. One can dream, right? I’ve wanted to do more, but unlike previously when I was trying to fit in and find myself, I find myself in a completely different position. Now, I’m pretty clear on who I am. On what drives me, what moves me, and what motivates me. I know the things that drain me, that hinder me, and that hurt me. The last few years of full time work outside the home office have been a considerable drain on my time and energies. This, however, is inexcusable (to me) when I say there are things I want to do, and don’t, because … well, mother of three, working full time, blah blah blah. It’s been the things I haven’t done that have helped me to understand who I am, and what I need to do. I’m not 100% clear on my purpose in life, but I know I need to do “something” and I have a vague and very general idea of the realm or genre this fits into. Where I’m struggling now is how to navigate this crazy world. I’ve never fit in, and I have long accepted that I never will. More than that, I don’t particularly want to. I am also aware and accepting of the fact that whilst I don’t and am not motivated to fit in, there are rules I need to follow in order to avoid or prevent conflict within the extended family or the workplace, that there are politics to navigate in any area of one’s life where there are leaders/committees/interested parties/stakeholders concerned. As one who doesn’t do the political game playing, I struggle immensely with this one. Mostly because the masters of the game just assume you, too, are playing the game, so frame everything you say and do with some sort of meaning or intent to destroy them. Also, it usually takes me about three days longer than a ‘normal’ person to realise that there is some level of manipulation or fuckery going on. By which stage, I’ve inadvertently dug myself into a hole that I wasn’t even aware I was digging. You say things and they are interpreted from the Political Player’s perspective, and before you know it, your admission that you like the colour pink has rendered you some sort of enabler of social expectations and a detriment to society. Worse, if you’re actually of the female-gendered persuasion and like pink, you’re buying into the patriarchy and it’s oppression of women, and doing nothing for the movement. I’m not sure which movement exactly. it is getting a little confusing. Also, I just really like pink. There’s nothing else to read into it. I just like it. One thing I have realised about myself is the need to do something charitable, philanthropic, and/or altruistic. Choose your word, I don’t mind. Essentially, I need a project of sorts that is to the benefit of someone else entirely. Where I can contribute funds, skills, time, assistance, something, and that gives me a sense of joy and fulfilment. I know this about me because it’s something I haven’t done for two years, and missing last year set me back quite significantly in terms of emotional and spiritual fulfilment. Or, to be less esoteric and wanky about it, I just needed to do something way out of my comfort zone, to experience something else, and to obtain the adrenaline rush I have come to rely on. 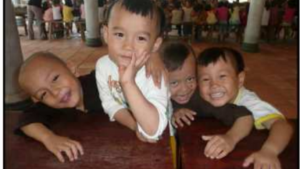 I’m writing this from a hotel in Vietnam, where I am volunteering, with my ten-year-old (the Littlest One) at an orphanage and charity school. From a practical volunteer perspective, we’re helping to ensure the littlest kids eat their full bowl of lunch. For some, it is the only meal they’ll get for the day. We’re helping to teach English to the kids from the pre-school (age 3) classroom, up to the grade fives. We’re also collecting donations to help pay for items that they need; including medicines and medical items, vitamins for the kids who are so malnourished they are underweight and tiny for their age, nappies, clothes, school supplies, food, filtered water drinking fountains, and, oh, all kinds of things. I’m using hashtags #MadCowsVoliday and #MadCowsPhamilyTrip for those of you who understand hashtags. I’m also cool if you want to follow / friend me on Facebook: www.facebook.com/MadCowAmanda – this is my ‘personal’ profile, but it’s so beyond personal I don’t mind. If you’d like to donate to the cause, the Littlest One and I have set up a charity page for our Phamily Mission. Have a read, it’ll give you a bit more info and context. Right now, I’m exhausted … so I’m going to get as much sleep as I can before another (our third) day at the orphanage and charity school.